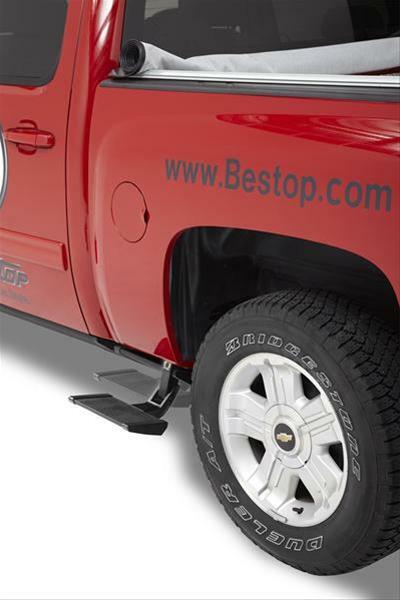 Bestop TrekStep Side Bed Steps 09-18 Dodge Ram Bestop TrekStep Side Bed Step 09-18 Dodge Ram, Bestop TrekStep Bed Step 09-18 Dodge Ram, Bestop Bed Step 09-18 Dodge Ram, TrekStep Side Bed Step 09-18 Dodge Ram, Bestop 75306-15 Truck Bed Step, [Bestop 75406-15 Truck Bed Step] - $219.95 : 3rd Strike Performance, Your Source for Late Model MOPAR Performance Parts and Accessories! Notes: Provides 6.00 to 8.00 in. of downward extension depending on application. Has a 300 lb. capacity.